A ton of little tasks need to get completed when onboarding a new employee. Payroll, company policies, account creation, password sharing, signing documents. And the stakes are bigger than we realize. Employees can instantly feel how polished our onboarding process is as they go through it. Sometimes, companies have the details dialed and give the impression of being on top of everything. Sometimes companies don’t. New employees will be able to tell within the first few days. I’ve come to realize that onboarding sets the tone for new employees. If a company gives the impression of being on top of all the details for their onboarding, employees will pick up on that and follow the company’s lead. The employee’s work will then be more polished and detailed. But if a company’s onboarding process is fast and loose, the employee’s work will also be fast and loose. I greatly prefer teams that are on top of all the details. 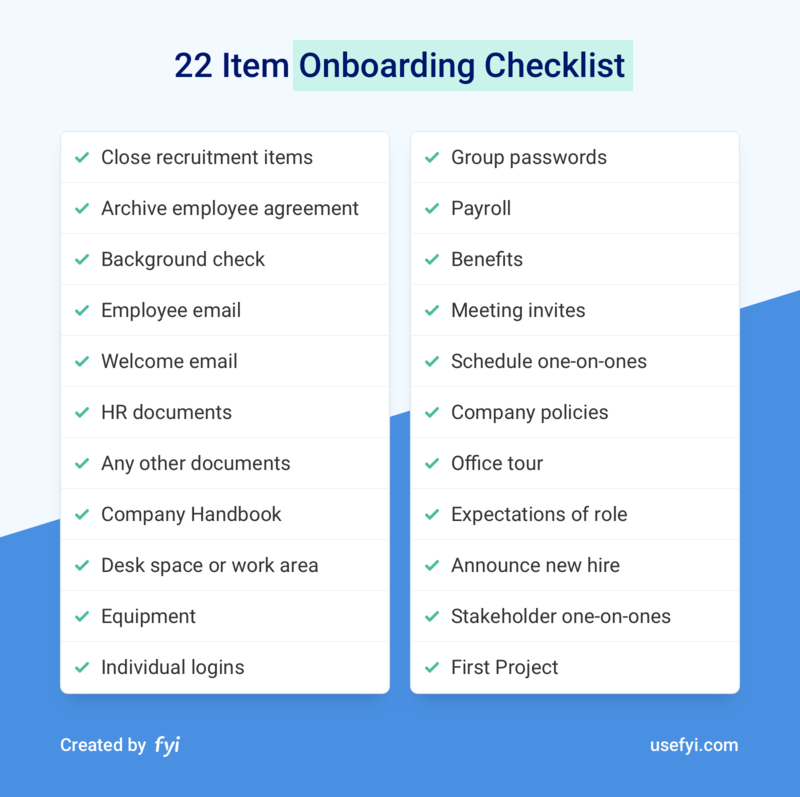 Which is why we put together this 22 item onboarding checklist. After all, checklists help us remember a bunch of small tasks that we’d normally forget. Whenever we onboard a new employee, we run through the checklist to ensure nothing gets missed. That helps improve the quality and detail of work from every new employee. If I’m on top of the details, they’ll be on top of the details. For a high-level overview on how we approach onboarding, check out our post on the onboarding process. We cover our 4 onboarding principles and the 7 core steps that we spend the most time on in order to get a new employee fully ramped up. That’s how we get new employees onboarded within 2 weeks. Let’s dive into the onboarding checklist. As soon as I get an offer letter signed, I’m thrilled. Not only do I have a new member joining my team but I can finally stop worrying about the recruitment process that has typically lasted for at least a few months. Close the open role in your recruitment tool and make sure the open role is no longer listed in your careers site. Remove any job board postings that are still live. Notify any other candidates still in the pipeline that the role has been filled. If you plan on recruiting additional people for the same role, skip this item in your checklist. This item is really easy for me to forget but it’s super critical. For all signed documents and contracts, the company needs to have them consolidated and stored somewhere that won’t get lost. Wherever that location is, make sure to place the final, signed documents in that location. With any luck, you’ll never need to refer to that document again. But if something comes up and you need that document, you want to make absolutely sure you still have it. Not every company does this but it is a good practice to get into. It’ll catch egregious items that could make you rethink the hire. At this point in the checklist, it’s exceeding rare to discover something in a background check that would halt everything. The vast majority of the time, this is just a formality and nothing comes up. But in the one case that it does reveal something, you’ll be exceptionally grateful that you took the time. And in that case, you’ll have to start the recruitment and onboarding from scratch. The first onboarding task is usually to create the employee’s company email. This is the email that will used for everything else so it’s good to get this created right away. I like to send the welcome email a few days before the official start date. This makes the new job feel real and helps the employee get excited before their first day. 2-3 sentences telling them how excited you are. The agenda for their first day. Info on how to set up their work email. Any HR items that they need to complete before their start date. Close the email by telling them how excited you are again. There’s always a few standard employment forms that need to be filled out and signed, like the W4. Get these sent to the employee and have them complete everything. Also remember to store these forms along with the rest of the documentation for the employee. Different industries have different regulations and requirements. If there’s anything else that needs a signature, get that completed and archive the documents in the right location. It’s a great practice to write down all your standard policies and keep them in a single location. This is usually called the Company Handbook. Sometimes it’s an actual PDF, other times it’s a company wiki or folder of Google Docs. However you keep it documented, make sure to send a copy to the employee. Including this in the Welcome Email is a good practice. One of the standard rules of management is don’t expect people to follow a policy unless you’ve told them very clearly what that policy is. Preferably multiple times. Include all rules and expectations that you want the entire company to follow. And if you don’t have a Company Handbook, build a Team Handbook to get your own team aligned with your expectations. Whatever process that your company has to assign desk space, an office, or work area, go through that process for the new employee. It should be available in time for their first day. If there’s any equipment that will be assigned to the employee, put that request in and make sure it’s processed. A common example is the company laptop that the employee will be using going forward. Other common equipment could include a company phone, industry equipment, or a company car. Use the employee’s company email to create the accounts so that invite and account creation emails are in their inbox, waiting for them on their first day. Passwords are much more secure because no one is sharing passwords with each other. No one even knows the passwords themselves, they just click the button from their browser plugin and the password gets shared automatically. If you ever have a security issues, you can update your passwords and anyone that still has access will start using the new passwords immediately. It’s super easy to onboard new employees. Create an account for them, share the appropriate folder, and you’re done. Lastpass is popular but I personally can’t stand the UI. I find it very difficult to use. 1Password is much better in my opinion. One of the most critical items of any onboarding checklist. Make absolutely sure this gets done immediately so there’s no delays in the first paycheck. Lots of folks live paycheck to paycheck and can go through severe stress if paychecks are delayed even slightly. Get this over to the employee as soon as you can. The two common items to worry about are healthcare and the 401k. Also include anything for life insurance, disability, vision, dental, and all other benefits that are part of your compensation package. Hopefully, you have an HR tool that can handle most of the forms for you once you enter in the employee’s basic information. Invite the employee to all regularly scheduled meetings like team weekly kick-offs, daily standups, company all-hands, status meetings, and anything else that’s part of your normal meeting cadence. I’ve found that it’s super easy to forget this task when I’m not using an onboarding checklist. And it can be super embarrassing as a manager to wonder why a new employee isn’t in a team meeting when I’m the one that forgot to send the invite. I always schedule a one-on-one as early as possible on the employee’s first day. This allows me to welcome them to the team, give them an overview of what the first week will look like, and answer any immediate questions that they have. For me, I make a habit of doing one-on-one’s every week with my team. I also get the weekly one-on-one scheduled as I’m planning the agenda for the employee’s first day. That way they know there’s ongoing support from the beginning. This checklist item is a review of the core policies from the company handbook. Definitely cover the most important policies that must be followed. As a manager, I always feel like these items get really repetitive. But they’re brand new to the employee and we all need to review material several times before it really sinks in. The fact that you have a written version with your company handbook along with the verbal overview that you do on the first day helps cover different types of learners. If you have enough time to review these policies during the first one-on-one, great. If not, schedule a separate meeting on their first day to go over this. Introduce them to all the individuals on their immediate team. Their desk and everything that they can consider to be theirs. Kitchen, break, bathroom, and common areas. Any policies around entry and exit. General layout of other departments. Where to find HR or other key resources for the company. Where to find yourself, their manager. One of the most important items in the checklist. It’s also the item that I’ve tended to skip the most as a manager. I think most managers forget this step to be honest. Does the employee know exactly what metric they need to hit, if any? Are goals and deliverables well defined so that there’s no ambiguity? For every task, does the employee know what done looks like? Are there clear examples of what bad versus good work looks like? Have you documented every expectation that you have for that role? A high quality job description covers a lot of this but it’s also common to have a more thorough set of expectations that’s used internally. The sooner you review this with the employee, the sooner you’ll get the performance that you’re looking for. I prefer to do this during a department or company meeting, it feels more exciting for everyone than simply announcing the new hire via an email or Slack message. On the next meeting that’s most appropriate, introduce the new employee to the larger organization. I always have new employees on my teams set up meetings with key stakeholders on other teams. That gets them comfortable reaching up to these people and helps build bonds across the organization that will be critical to their success later. I also give the employee a list of people to schedule one-on-ones with on their first day. Another super important item in this checklist. We go into a lot of detail on this item in our 7 step onboarding process post. Basically, you want to assign a project that’ll stretch the new employee slightly to help them grow into the role without drowning them in a super difficult project. Also try to find a project that’s part of their core workflow while also scoping it to be about 2-3 days worth of work so you can review it after one week on the job. 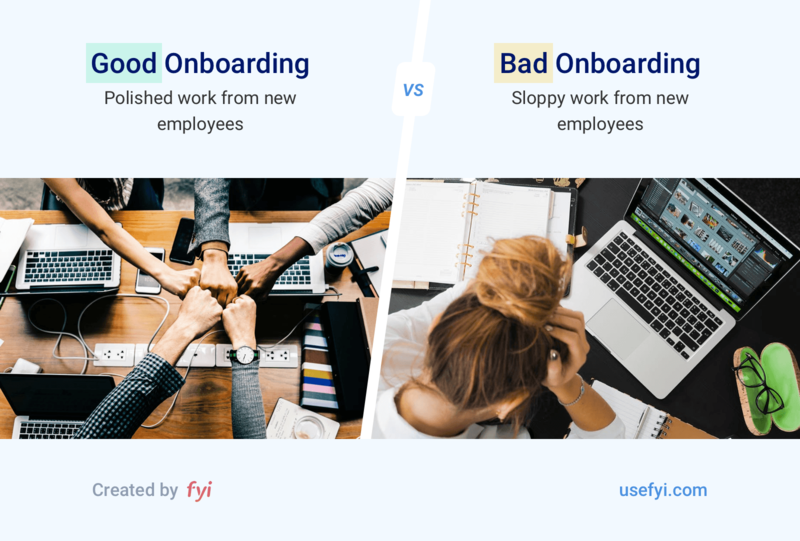 Get this right and the new employee will quickly settle in, it’s the key to getting an employee onboarded within 2 weeks instead of letting an onboarding process drag on for months.